Meg is an absolutely gorgeous 1965, 15 window, split screen Microbus and can seat up to seven passengers, besides the chauffeur. She is a shining example of a lovingly restored vintage Volkswagen and turns heads, not to mention makes a few jaws drop, wherever she goes. Although Meg has a full width rock and roll bed (which can convert from her seating area) she has no kitchen facilities. This is why she is known as a Microbus. 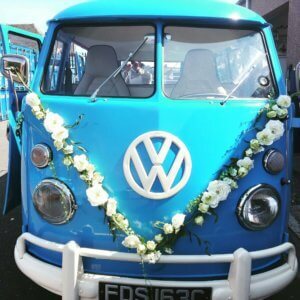 She has more seats than our other campers and can be booked for your wedding or any special occasion with chauffeur.